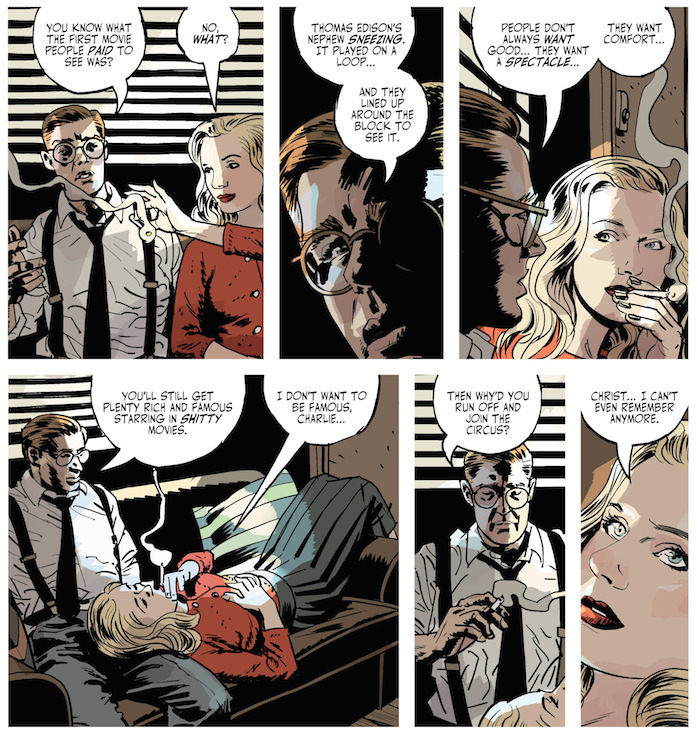 This second issue keeps the ball rolling with this mystery we’re getting entwined in. It’s odd, I read through these so fast but something about the way they’re written makes them feel like they’re so much more than one issue. It’s brilliant. I read them in a few minutes and feel as though I’ve read a lengthy chapter in a crime novel. They’re real beefy. Issue One brought us the death of actress starlet Val, whose body was discovered by Charlie, who had no idea what happened & how she got their, dead. He flees the scene, is understandably shaken up, confused, and curious; but not about to go digging up for answers. This issue opens with Val’s funeral, a sad sight of mourners who are actually upset & some who are most likely faking it for the cameras. How appropriate. 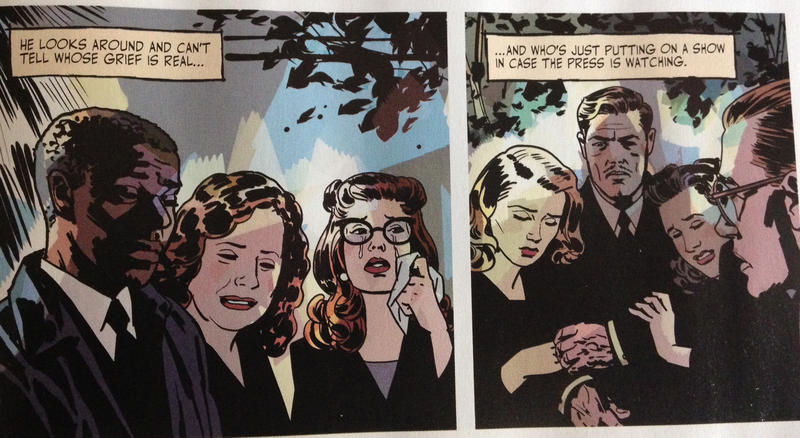 At the end of the first issue, Charlie had presumably gone on to tell his best friend & coworker Gil about how he had discovered Val, and that it couldn’t have been a suicide like they publicized it. Now, Gil is in a real bad place. In every panel we see Gil this issue, he’s completely drunk, angry, and all over the place. Charlie is left to deal with Gil’s problems as well as his own. Luckily for him, that brings him closer to Gil’s wife, who he is clearly in love with. A whole plot between the two of them is definitely brewing. In his own fit of anger, Charlie has a flashback to a conversation he had with Val. They are in his office, discussing the movie. Val needs Charlie to make her character better than what the producers want; rewrite her lines, add more scenes, but Charlie’s hands are tied. It’s also revealed separately that Charlie hasn’t been able to write since the war, and Gil has actually done all the writing for their team. Val lays on Charlie’s lap, playfully. The memory paints a much more flirty & romantic portrait of Charlie’s relationship with Val, and I’m thinking their might be more their than we think. With only being two issues in, there’s a whole lot we don’t know. As far as the movie itself is concerned, the producers are all up in arms about what needs to be done now that Valeria is dead. He scenes need to be reshot, something’s need to be rewritten. Everyone is scrambling to figure out how this must be done, because scrapping the picture isn’t an option. Mr. Thursby gives everyone two extra weeks to rework things, meaning 25 days until wrap. Everyone is wicked pissed & stressing to the max. But of course, Charlie has bigger things weighing on his mind. Gil seems to be taking it surprisingly hard, too, though. This issue ends in him going on a drunken bender, ending up at Val’s grave, where Charlie finds him. Gil is angry beyond belief, stressed about what really went on with this murder, suspecting that it has to have been someone from Victory Street Pictures. Charlie attempts to calm Gil down, but instead, gets the crap beat out of him. He takes it, letting Gil take his shots, and after insists that they go get a drink. This series is heading all sorts of places, Fangirls. We’ve got things from the past seeping up, and the grand mystery of this murder just beginning. This comic will no doubt be taking us on a wild ride, I can feel it in my bones. So far, it’s a fantastically written story, and even more enjoyable to look at. The illustration is beautiful beyond belief, it makes me want to cry. 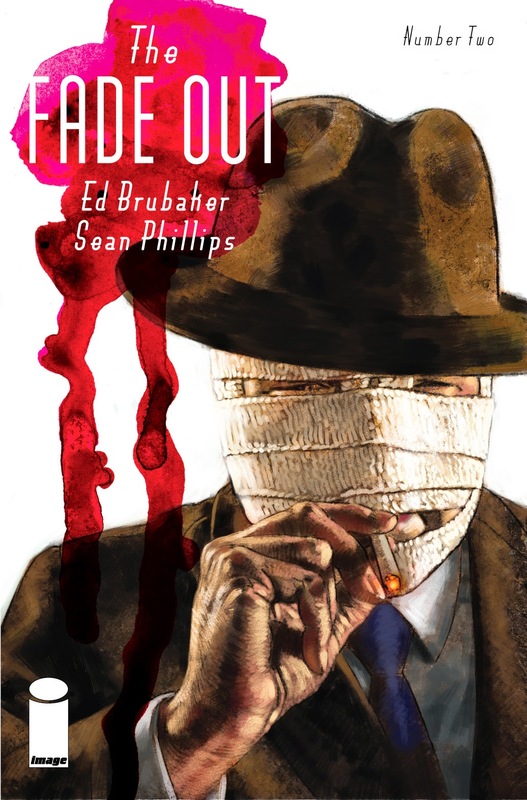 The Fade Out is already five issues deep, and things get intense right from the get go, so hop on board while you still can, friends. I would feel awful if you were to miss out on this crazy crime adventure.